It's yours, isn't it? I should have recognised you by your footwear. oh, so you recognised my ankles. Recognise them? I've been lusting after them for years! The entirety of the conversation I had with a fellow commuter near Newington Butts. The bike in question was a deep shiny maroon with chromed lugs. Because the rider was a tall chap, it was of double top-tube design, with double seat stays. The rack was an integrated one, colour coded with the rest of the frame, brazed to the lower seat stays, coming around the higher ones to form a rectangle of narrow tubing with semi-circular ends and wires gridded across. There was an extra pair of rack stays brazed to the rear dropouts. Very stylish and distinctive. I saw him near the Oval a couple of months ago. It's a beautiful piece of kit. Isn't it? I wonder now if he built the whole thing himself - perhaps with the help of our Bicycle Repair Man? He did tell me that he had built it, that much I do recall. Saw a group of five Moultons on the A29 between Fontwell and Nyton. Four spaceframes and one gorgeous modernised Mk3. Onderwater kid first tandem. There are several of these (2 and 3 seaters) in Cambridge, but I guess these are rare elsewhere. They are cracking fun, mainly 'cos the the freaked out look passers by give when they assume the 5 year old at the front is in control (the steering is via linkage from the back). There was also a Trek with Alfine 8, roller brakes and a Gates belt drive in the shed at work. The owner had thoroughly disguised it with tape, then only locked it to the stand with a thin cable . Hopefully the CCTV will scare the thieves away, although it's not stopped stuff going missing before. That's so cool! And in that red it looks like it's been assembled by a gang of fettlicious posties. Just around the corner from home: an Asian man on a BSO with an occupied child seat on the back. It was the occupied child seat which made the sight interesting and unusual. Near Kennington, I rode up behind a very yellow bike with an integrated welded rear rack. I wondered if it were a kind of loadbike, but it turned out to be shorter than the Yuba/Ute/Big Dummy bikes. 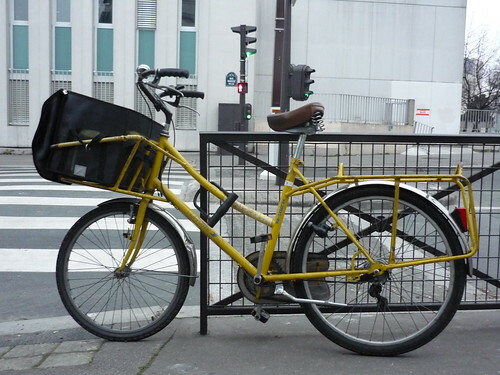 As I pulled alongside, I saw it was rather like this, a French postie's bike. ..... a French postie's bike. There's a shop in Kingston that sells them , and other old imported French stuff. Oh that'd be worth a geg. Was at The School Run Centre getting our trike (the orange one with a black hood on the right) serviced when I spotted this yellow contraption. It's a clog bike. 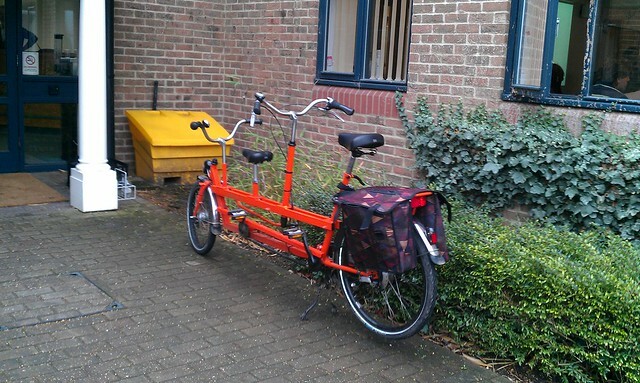 Apparently it's a no-cost factory option for the Bakfiets.nl cargobike long. Took it for a spin - much lighter than the wooden box. However, as yet, no screen or hood. Makes it a non-starter until then, for my money. However, if you like a bit of attention, it's just the ticket. A spin along Mill Road got lots of comments. Defietsfabriek 995. Were only a couple in the country when we got ours. I've now spotted two more. 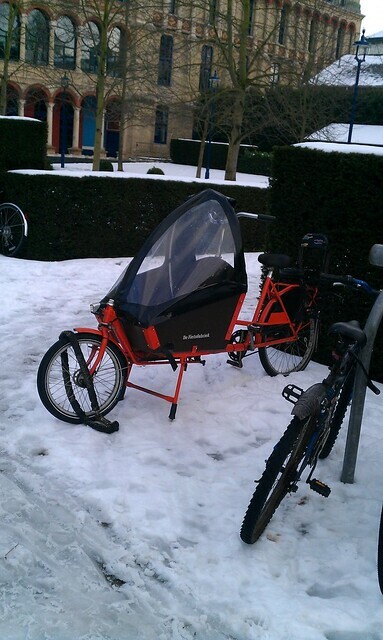 This one is a Mk1, and they've fitted a Bakfiets.nl hood, which fits well and is a massive improvement on the crappy one DeFietsfabriek sell. Wish I'd thought of that when we had ours. Cracking bike. Very relaxed ride, and wonderfully put together. I still miss our (which went to London, and is now back in Cambridge, still sporting the reflective tabs we added). On the commute today, I was pleased to see a Claud Butler and a Carlton in Kennington (or thereabouts), as well as a very smart newer bike with a blue & silver paintscheme and lightly purple anodised rims in Streatham. Sadly, as I was passing by, and the owner was waiting to cross the road, I didn't get a good enough look to determine maks. About half an hour ago, a recumbent with red disc wheels going up Cotham Brow. I'd guess at it being a Siberian dog rig. I remember we saw some on someones driveway on a WARTY ride, and got invited to see the dogs. looked somewhat similar WJ. I think you have solved a mystery once again.